Showing 1 - 20 of 113 results. Photograph captioned by BeckerFraserPhotos, "210 Tuam Street". 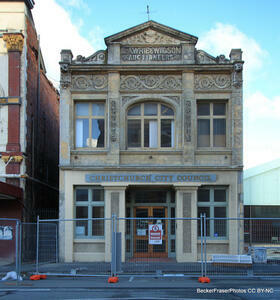 A photograph of a Christchurch City Council building on Tuam Street. One of the windows on the bottom floor has shattered and there is glass on the footpath below. 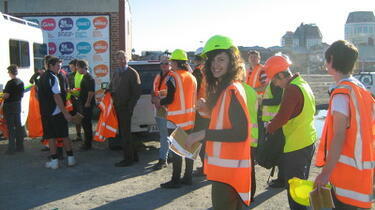 A photograph of Danica Nel and other workers standing in line with their authorization forms for the Residential Access Project. The project gave residents temporary access within the red-zone cordon in order to retrieve items from their homes after the 22 February 2011 earthquake. A photograph of a Christchurch City Council completed authorization form. 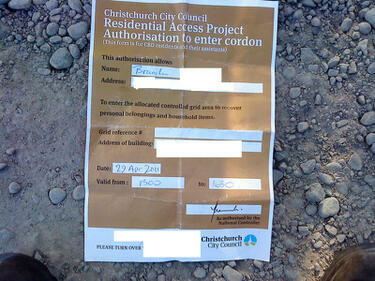 This form was part of the Residential Access Project which gave residents temporary access within the red-zone cordon in order to retrieve items from their homes after the 22 February 2011 earthquake. Personal information has been removed from this photograph in order to protect the individual's privacy. 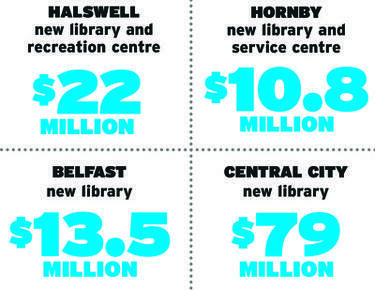 A graphic showing the costs of proposed new libraries. 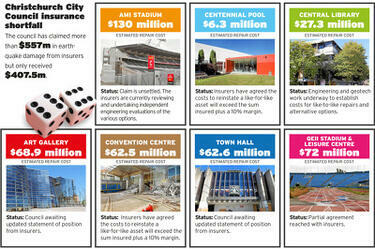 An infographic showing estimated repair costs for major Christchurch City Council facilities. 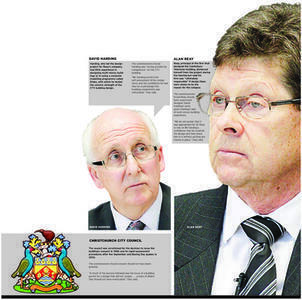 A graphic illustrating the findings of the Royal Commission enquiry into the CTV building collapse. A graphic showing the council's liabilities on infrastructure and the anchor projects. A copy of a letter from Hugo Kristinsson which was sent to Helen Beaumont, Manager of the Natural Environment and Heritage Unit at the Christchurch City Council, on 17 June 2014. The letter was sent on behalf of Empowered Christchurch. It is about legislation which, according to Kristinsson, determines land below the mean high water spring to be public land. Kristinsson is concerned that this legislation will cause 'hundred or even thousands' of people to lose their assets. He urges the Council to 'have the land surveyed and to redefine the CMA [Crown Minerals Act] before land claims are settled'. 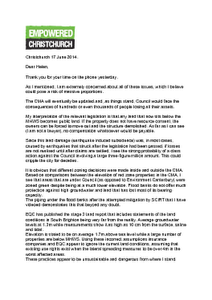 A copy of a letter from Empowered Christchurch to Peter Sparrow, Director of Building Control and Rebuild at the Christchurch City Council, sent on 23 October 2014. 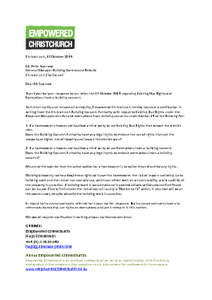 The letter is a response to another letter sent by Peter Sparrow to Empowered Christchurch regarding existing use rights and exemptions from a building consent. In this letter, Empowered Christchurch requests furthur clarification from the Christchurch Building Consent Authority about these concepts. A copy of a letter from Seamus O'Cromtha which was sent to the Chief Executive of the Ministry of Business, Innovation and Employment (MBIE) on 3 September 2016. The letter was sent on behalf of Empowered Christchurch. 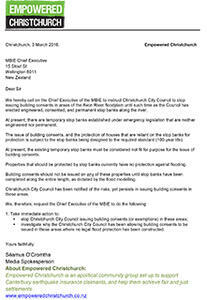 In the letter, O'Cromtha calls on the Chief Executive to instruct the Christchurch City Council to stop issuing building consents in areas such as the Avon River floodplain until stop banks have been erected along the river. O'Cromtha comments, "Properties that should be protected by stop banks currently have no protection against flooding". A PDF copy of a letter from the Anglican Advocacy (formerly the Anglican Life Social Justice Unit), to Christchurch City Council requesting exemption from parking requirements for inner city east landowners. 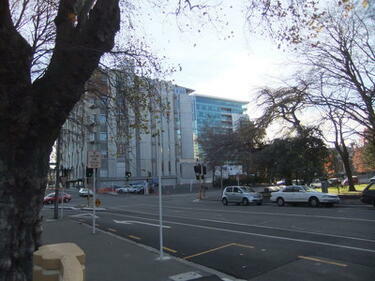 A photograph of the Christchurch City Council Building on Hereford Street, taken from the Hereford Street bridge over the Avon River. 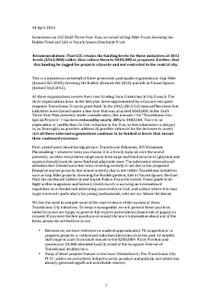 A Gap Filler submission to the Christchurch City Council Draft City Plan on behalf of the Gap Filler Trust, Greening the Rubble Trust and Life in Vacant Spaces Charitable Trust. The submission recommeded that the Christchurch City Council retain the funding levels for these intiatives at 2012 levels ($565,000) rather than reduce them to $400,000 as proposed, and that this funding be tagged for projects citywide and not restructed to the central city. 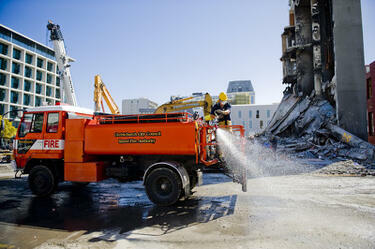 A truck fire fighter from the Christchurch City Council Rural Fire Authority spraying water on the road next to the CTV Building. 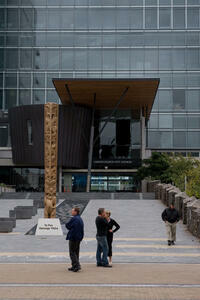 Members of the public standing outside the Christchurch City Council Offices on Worcester Boulevard, shortly after the 22 February 2011 earthquake. 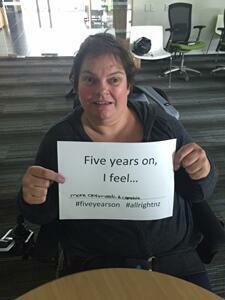 A photograph of Rachel Mullins from the Christchurch City Council taking part in #FiveYearsOn. 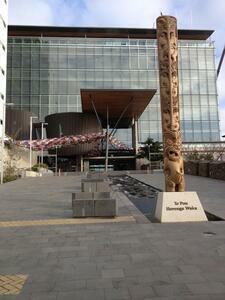 The Christchurch City Council was an All Right? Champion. Mullins holds a sign which reads, "Five years on, I feel... more optimistic and capable." All Right? posted the photograph on their Facebook Timeline on 21 February 2016 at 9:12am. All Right? 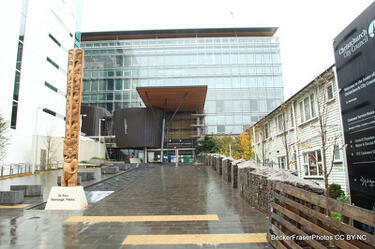 captioned the photograph, "Rachel from the Christchurch City Council is feeling more optimistic and capable". 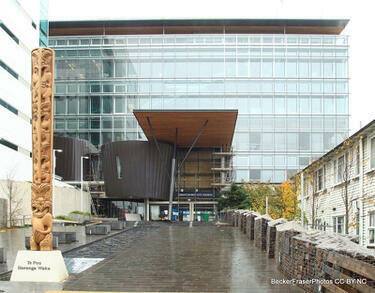 A photograph of the entrance to the new Christchurch City Council Civic offices on Worcester Street. 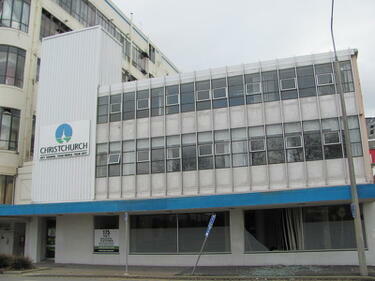 The new Christchurch City Council building on Worcester Street.